Scuba World is proud to boast its magnificent Coral Reef sites and show you around. Recent studies have proven what we've always known, Mooloolaba hosts some of the most healthy and beautiful coral reefs and we can take you there! We have up to 15 different dive sites. The majority of the dive sites are shallow (15 – 20 metres) and are suitable for Open Water divers. The highlight of the Mooloolaba Reefs is the incredible macro life. Want to explore the beautiful Sunshine Coast and Noosa area on a totally relaxed and laid-back guided tour? If so, a Sunshine Coast and Noosa private tour is exactly what you're looking for!We offer a fantastic full day or half day private tour. More than enough time to get a real overview of how stunningly beautiful and fun-filled this area really is. We understand that not everyone wants to head out for the day with other groups, and instead, they prefer to enjoy the peace and serenity of exploring with close family or friends. Group tours are certainly fun-filled, but for larger groups, or for those craving a personalised adventure, a private, guided tour is the choice to make. Planning your own tour or need transport to a special event on the Sunshine Coast? We'll take care of everything for you with our popular Charter Service. No matter what your needs, this 11 seat minibus and professional accredited driver are at your service. This tour is for real foodies – join us for a fancy high tea and wine tasting. This full day tour involves a fabulous high-tea at Flaxton Gardens, a visit to Montville village, afternoon tea beside a lake, wine and cheese tasting at Flame Hill Winery and a visit to the Yandina Nutworks. Experience Australia's premier Eumundi market, which is absolutely buzzing on a Saturday. Come and enjoy the enchanting experience of the world famous Original Eumundi Markets – renowned for locally made artisan treasures. Open rain, hail or shine. Browse Australia's premier artisan market then journey to historic Gympie, the heritage city!This full day tour involves visiting the legendary Eumundi Markets followed by a scenic road journey before stepping back in time in historic Gympie. Departs every WEDNESDAY Price Includes : Free Entry to Eumundi Markets, Entry to the Gympie Gold Mining and Historic Museum, Lunch in the historic Gympie train station, Wine Tasting & Cheese Platter, . Experience three amazing Sunshine Coast attractions. See amazing wildlife up-close and personal at Australia Zoo, eat & ride your way around the iconic Ginger Factory on an optional Factory Tour or watch a Live Bee Show, then visit Nutworks is supplier of macadamia nut products and confectionery! Entry to Australia Zoo in NOT included. Set out on a whale watching tour from Mooloolaba to see humpback whales on their annual migration between Australia and Antarctica. Your 3-hour cruise is limited to 22 people, which allows for great viewing opportunities without the crowds. Have the chance to see whales frolicking in their natural habitat, and look for dolphins too. The informative and friendly crew shares in-depth knowledge on the marine life of the region that you get to see firsthand. This is a fun fast way to get out and about whilst out at sea looking for the whales. Once the whales have been spotted we slow down, place Hela-Va Jet into neutral, open the doors and you can observe the whales at a viewpoint not many will ever experience, so close to sea level. We are entering an uncontrolled environment and what ever happens it's on the whale's terms. On the way back the skipper will hit the peddle and have a bit of fun. This is not a thrill ride but some fun. Height & weight restrictions apply. Height – 1.3 m Weight – Max 110 Kg. Bring home fresh fish and crab on this deep-sea fishing trip from Mooloolaba. Travel aboard a large covered vessel with an experienced local crew that supplies all high-quality fishing gear and light refreshments. 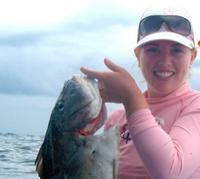 Have your choice of a 5-hour or 9-hour trip, options suited for fishing enthusiasts and beginners alike. Get expert tips from the crew and enjoy the camaraderie of a day on the ocean. If you catch something, your crew prepares it so that you can take it with you at the end of the trip. Race along the open ocean on an adrenaline-fueled jet boat ride from Mooloolaba. Your boat dives, spins, and skips on the open ocean. Your expert captain makes sure that you have a thrilling ride while staying safe on a boat that is designed for the rugged waters along Australia's coast. The fully enclosed cabin lets you get all the excitement of a jet boat ride without getting drenched. Mooloolaba's famous Sunset cruise. A 2 hour relaxing cruise along the beautiful Mooloolaba river and canals. We offer a optional a-la-carte seafood menu and fully licensed bar on board. Indulge in the freshest seafood and cold crisp drinks while taking in the spectacular sunset. Entertaining commentary and table service provided, the best start to your evening starts here! Jump aboard this 1.5 hour relaxing seafood lunch cruise through the beautiful river and canals of Mooloolaba. Fresh seafood is included in the ticket price with a choice between fish, calamari, Mooloolaba prawns or an Aussie burger. There is a fully licensed bar and a optional menu with extra's and upgrades available on board. Table service is provided to your comfortable booth seating. Sit back, relax and enjoy the entertaining commentary and of course the magnificent scenery that Mooloolaba has to offer while you dine on the freshest seafood on the coast! : Opt to dive into the wreck of the HMAS Brisbane, a decommissioned guided missile destroyer that was scuttled 2.9 nautical miles off the Sunshine Coast, Light snacks on board, as well as hot snacks on return, HMAS Brisbane dive includes tanks and weights with other gear available for hire at additional cost, Available 7 days a week, . Prepare to be amazed and humbled as you witness these magnificent whales up close and in their natural environment as we cruise off the coast of Mooloolaba. Whale sightings guaranteed – if you don't see any you can cruise again for free during the same season. The opportunity to swim with a humpback whale is a rare and very special one – something that people who have experienced it have described as life changing. Enjoy the thrill of a water take-off and landing on the beautiful and tranquil Maroochy River in the only Wilga Warbird Seaplane in the southern hemisphere. It's 9cylinder radial engine, better-than-helicopter views, slow flight and stealthy vintage-spy-plane feel will give you a breath-taking perspective of the glorious Sunshine Coast. With every seat a window seat, you'll have unparalleled views of the beaches and river below. You'll soar over Cottontree, Maroochydore, Alexandra Heads, Mooloolaba beach and circle over Point Cartwright to return to touch down at Maroochy River. This quintessential Sunshine Coast experience takes you on a 10-minute flight/30-minute adventure but leaves you smiling for days.